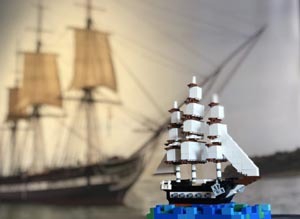 Inspired by the different ship designs on display in Masters of Miniature, head to the USS Constitution Museum to build your own ship with LEGO® and DUPLO® Bricks! In the hands of a creative kid – or kid at heart – a pile of colorful bricks can become an aircraft carrier – or USS Constitution! The nautical fun continues with a “Float Your Boat” LEGO® Challenge, “Picture Yourself” LEGO® Selfie Masks, a scavenger hunt through our Masters of Miniature exhibit, and much more! Is your family no longer playing with your LEGO® and DUPLO® Bricks? Donate them to the Museum!